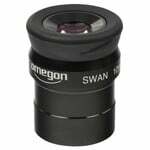 The Omegon SWA series represents a new milestone in super wide angle eyepieces. Super wide angle eyepieces have long been held in high regard due to their extremely wide apparent fields of view. 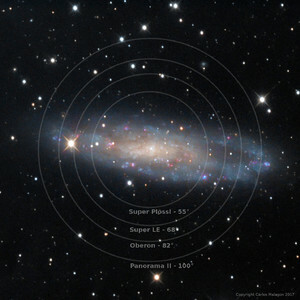 Only with SWAs did the so-called 'space walk' effect - almost like the view through a spaceship window - become reality. 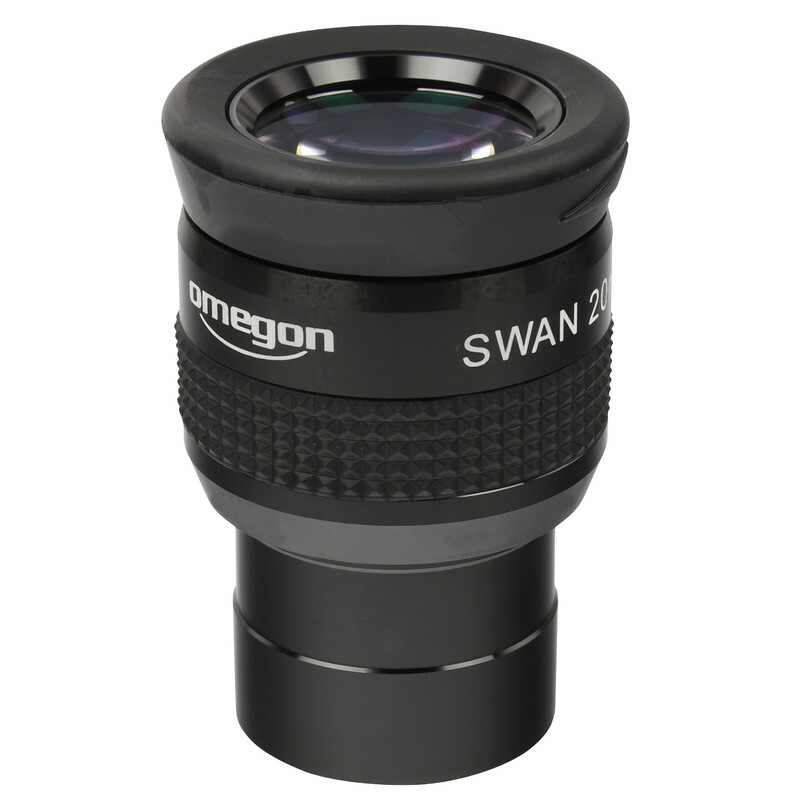 With their new look and new internal design, these new Omegon SWA eyepieces are a far cry from older SWA eyepieces. They are now equipped with higher grip rubber armour and with new eyecups which are not only more convenient but also increase observing comfort. In the optical department, there are now five glass elements arranged into three or four groups depending on the focal length involved. These give a 70° apparent field of view with high edge definition and a virtually distortion- free image. The human eye can still easily take in a 70° field of view without having to 'look around' in the eyepiece. 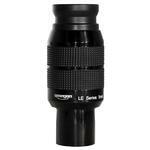 These eyepieces can also be used with relatively fast, short-focus systems. A new wide-band multi-coating means that light transmission has been increased even further. All lens edges are blackened and the internal baffle system reduces scattered light even further. Only high transparency glass surfaces and reduced reflections can ensure a really high-contrast image. The Omegon SWA series consists of six eyepieces: 38mm, 32mm, 26mm, 20mm, 15mm and 10mm. 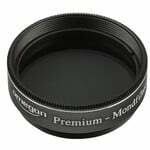 The 38mm, 32mm and 26mm eyepieces are 2" models. 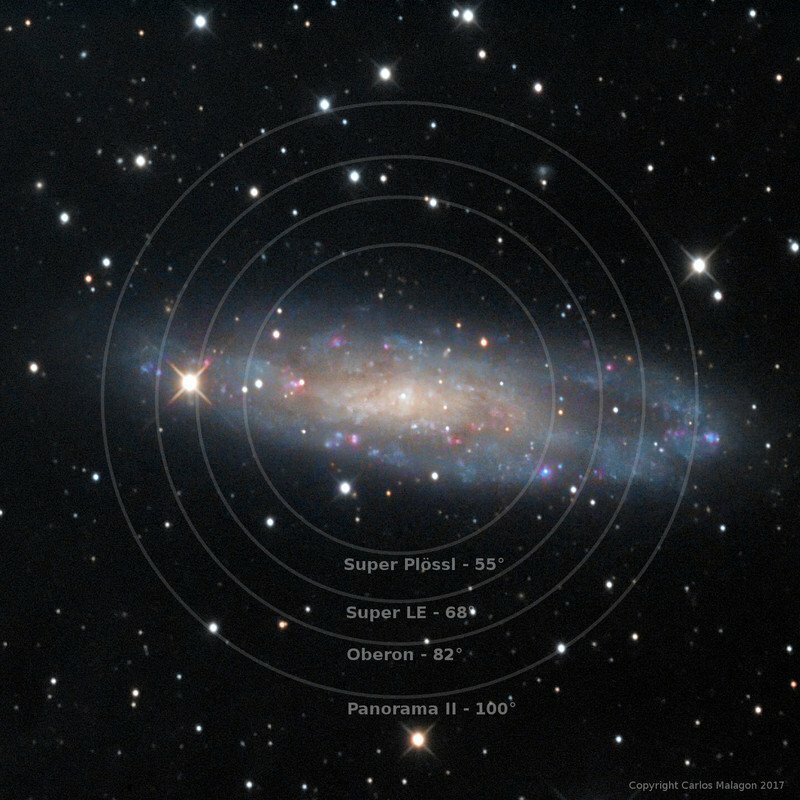 This means they are ideally suited to deep sky observing and provide enormous true fields of view. 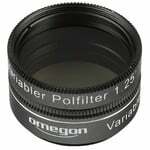 The shorter focal lengths: 20mm, 15mm and 10mm come with a 1.25” barrel. All the eyepieces in this series are parfocal, meaning refocusing is no longer necessary when changing between these eyepieces. The new eyecup design can be adjusted steplessly, allowing the viewing distance to be precisely adjusted as required. Even spectacle wearers will still be able to see the entire 70° field of view. 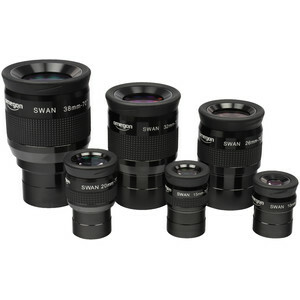 The optical designs of the Omegon SWA, Meade QX and Williams SWAN eyepieces are similar. Unlike its competitors however, Omegon SWAs have an adjustable eyecup and thus provide better protection from stray light and are individually adjustable for eye relief. In testing with an f5 Newtonian telescope, field correction was slightly better than for the Williams SWAN and light transmission slightly better than the Meade QX. The finish of the Omegon SWA is exemplary! An upgrade, but barely so. 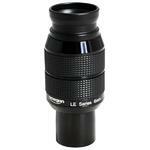 So I got these eyepieces as an upgrade from the EP that came with my 8 inch Skyliner from sastroshop (379 Eurpo). 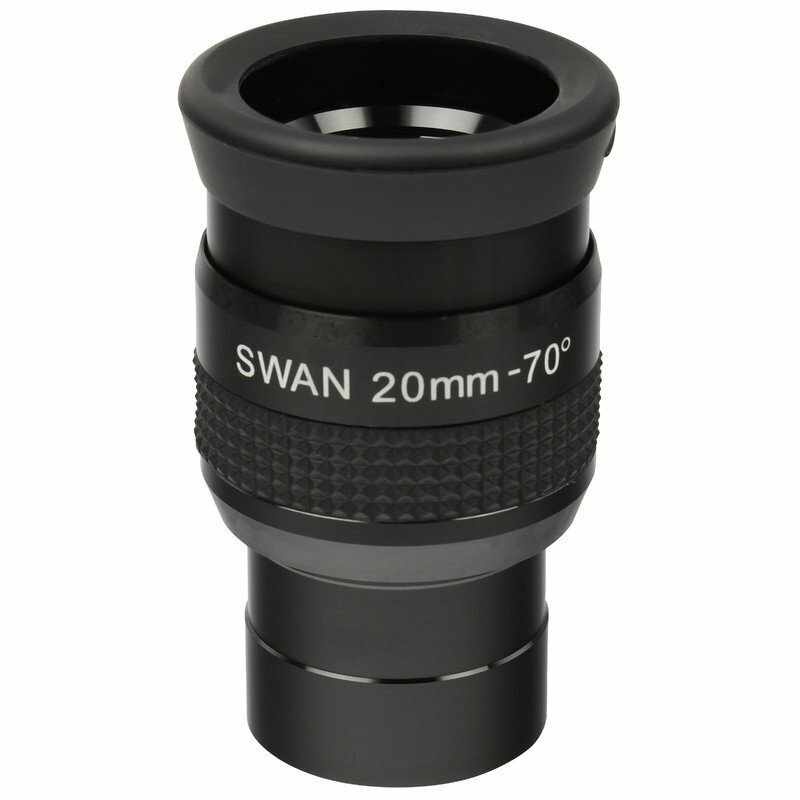 It offers a greater FOV (70 degrees) and has the SWAN logo on which I thought would represent good quality plus has a good medium magnification (1200/20=60x). The eyepiece is generally of a good quality, but I also got a Celestron Ultima LX EP and compared to that (135 Euro) the Celestron simply blows this EP out of the water (meaning there is a huge noticeable difference!) The SWAN 20 mm offers some nice views, and much greater FOV than standard EP. But near the edges (around 20-25%) the views get distorted. The eye relief is OK. On the plus side it doesnt weight that much. My advice: Skip this cheaper eyepiece and go for the next step: Meade 5000 series or Celestron Ultimas!